He’d done it for the first time when he wrote the score for Orson Welles “A Touch of Evil”. The year was 1958 and, until then, screen music was heavily classically influenced. Henry (or “Hank”, as called him his close friends) was one of the very firsts to introduce Jazz soundtracks in the movies, enhancing, in this particular case, that drama “noirness”. From then on, others followed his path, although none ever departed like he did from the old school of movie soundtracks. I could name Lalo Schifrin, Jerry Goldsmith and, most notably, the recent deceased John Barry. These creators introduced some pop music elements in their music, but I’d say the cannons of their antecessors of the first fifty years of the last century were still much present in their scores. To the best of my knowledge, Mancini was the only one who could do, in the same movie score, compositions and arrangements as disparate as, say: ”Flutter’s Ball”, “The Good Old Days” and “Experiment in Terror” which he did for the picture “Experiment in Terror”, in 1962, or “Hatari Theme”, “Baby Elephant Walk” and “Crocodile Go Home” in Hatari’s soundtrack. If you choose to pick, as an alternate, the motion picture “Breakfast at Tiffany’s”, you’ll find “Moon River”, “Sally’s Tomato” and “Mr. Yunioshi”; each one entirely different from the two others. So, he easily fluctuated between the upbeat, comical, languid, solemn and terrifying songs, in straight accordance to each movie’s plot. As a flute (piccolo) player in his early childhood, Mancini took it with him for the rest of his life. Ordinarily, he used it as a very tasteful substitute for strings (violins, cellos and the like) in a way unique, sometimes very gravely as demanded by the mood of the song or most cheerfully by contrast. Another trademark of his: the use of the bass registers of the vibes to stress a scene of great tension. Very simple and effective: no more than one vibrato touch was needed… Check it in the picture “Charade”, for example. For many, his renderings should be regarded as “easy listening”. I wouldn’t contradict them, but I’d say that, in its “easiness”, it was most sophisticated, supremely in tune and variegated and, when he wanted, very jazzy. Listen, for instance, his “Uniquely Mancini” and you’ll know what I mean: a textbook of mainstream jazz arrangements in which solos of flute, saxophone, muted trumpet, piano and drums were sported to great effect. For me, this is one of his most memorable records and it still sends chills through my spine every time I listen to it. It is a timeless piece of superb arrangements, done on well known standards of other composers, performed by truly great musicians! As much as possible, he preferred the light side of life and his music was the proof of this. Humor was always present in his renderings which, many times, was introduced in parallel, in clearly contrast to the main course of the song he was performing… Something such as this, perhaps, contributed to the whole of his work to be taken as inferior to the production of some others: he didn’t take his tasks for serious, did he? Was that the reason? He was just aware there’s nothing 100% sad or funny and he wanted his music to be a proof of this. As a rule, solemnity was almost always absent from his work and maybe responded to his long teaming with movie director Blake Edwards, who surely directed a kind of pictures more akin to his music. But, hey, he could be serious when necessary! It always seemed to me his greatness was underrated - vastly underrated -, irrespective of the fact that his performances were very difficult to improve upon. For many years, I was bothered by the indifference jazz musicians felt for his songs. Shouldn’t “Two for the Road”, “Breakfast at Tiffani’s”(more to my liking than “Moon River”, both from the same movie), “Dear Heart”, “Days of Wine and Roses”, “Mr. Lucky”, “Just for Tonight”, “Whistling Away in the Dark”, “Charade”, “Experiment in Terror”, “Just for Tonight”, “Snow Fall”, “A Shot in the Dark”, “Soldier in the Rain” and many others deserve their attention? Or were them difficult to improve on, as I always thought? I agree that his late years weren’t that memorable, and that commercialism took his career in those times, but what he did, mainly in the sixties and seventies, was a work of great expetise and should always be so praised and, consequently, never be taken for granted. Thus, his work shouldn’t be regarded as shallow hits of that season; something to be forgotten before the arrival of the next one. It has a long lasting value and so must be deemed. 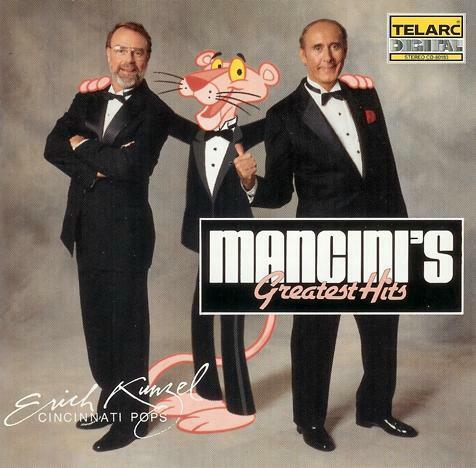 Jerome Kern, Cole Porter, George Gershwin, Richard Rogers were giants of their arts and have all got the acknowledgments they deserve, but Mancini also belongs to the top list of the great American composers, and his musical production should be better entitled.